The Library is open to the public from Tuesday to Friday each week, between the hours of 9.00 a.m. and 4.00 p.m., by appointment. For further information please call the following telephone number: (0039) 02-86460403. The reading room is on the second floor of Casa Manzoni, and can accommodate up to eight researchers at a time. Services offered include wifi and photocopying. Library users must show an ID document and complete a registration form. Books are not available for loan. Casa Manzoni is located in Via Morone 1, Milan, Italy. Home to the Centro Nazionale di Studi Manzoniani, it houses a library of approximately 38,000 volumes, as shown by the inventory. In his will dated 13 August 1867, Manzoni provided that ‘all those books that are to his liking and especially those bearing annotations’ should go to his son Pietro. As the latter passed away a few weeks before his father, the will remained unaltered. It was therefore agreed that the library should be split between Pietro’s four children. Three of these donated their share to Pietro Brambilla, the husband of their sister Vittoria. In 1886 Brambilla offered the collection to the Braidense Library, on condition that within the library, ‘a special room should be set aside to the memory of Alessandro Manzoni, to house all his manuscripts and everything else that could be considered useful to ilustrate his life, thoughts and times’. • the Fondo Alessandro Manzoni, kept in the house at Via Morone. This collection includes the 3,093 volumes which belonged to Manzoni (36 from the sixteenth century, 78 from the seventeenth century, and 729 from the eighteenth century), first editions of Manzoni’s works, and various books bearing his own handwritten annotations. 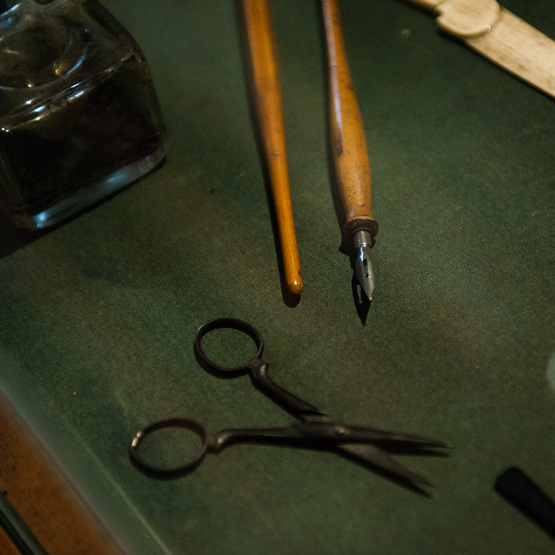 • the Fondo Manzoni, kept in the Braidense National Library. This comprises 550 volumes which were originally part of Manzoni’s personal library, 200 of which annotated by Manzoni. • the Fondo Manzoni, kept at the villa at Brusuglio. This includes a total of 1,554 volumes (four of which from the sixteenth century, plus printed editions from the seventeenth and eighteenth centuries). The current fonds, which holds all new acquisitions. Consists of items in possession of Cesare Arieti, who edited Manzoni’s correspondence in three volumes published by Mondadori in 1970. 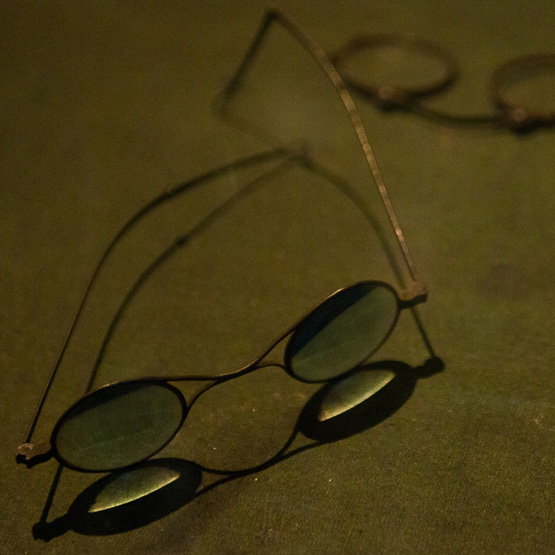 Items left to the Centre by Don Umberto Colombo, curator of Casa del Manzoni from 1983 to 1995. 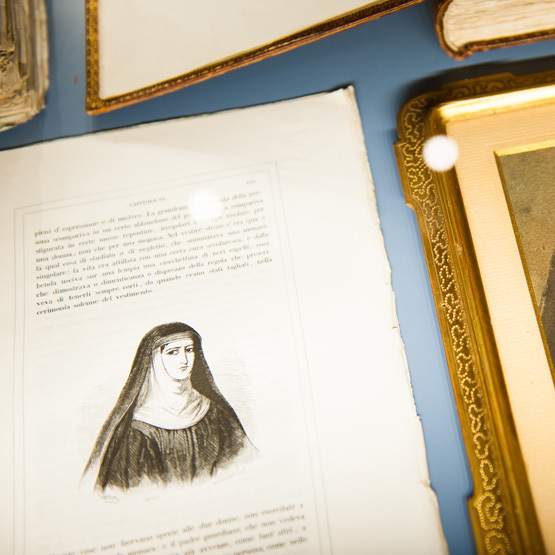 Small fonds of works and documents of Emilio de Marchi, donated to CNSM by the writer’s grand-daughters, Magda and Cesarina. Books left to the Centre by Claudio Cesare Secchi, former secretary, director and president of Casa Manzoni. 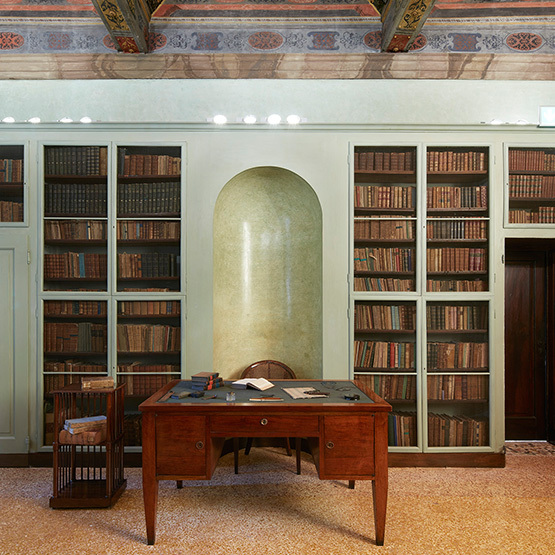 The library of Stefano Stampa, Manzoni’s stepson, including the books owned by Teresa Borri Stampa, Manzoni’s second wife. The fonds also contains many illustrated editions, books annotated by Teresa Stampa and Stefano, not to mention some sixteenth- and century editions. 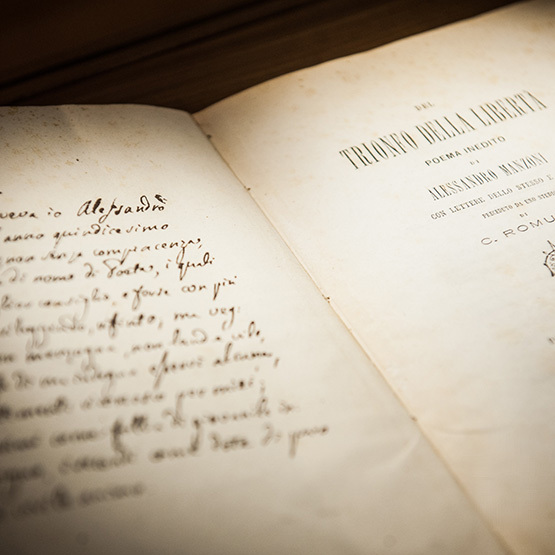 Books donated to CNSM by senator Giovanni Treccani degli Alfieri, who had acquired the volumes owned by Marino Parenti, first curator of Casa Manzoni. The distinctive feature of this fonds are the editions of The Betrothed published between the ventisettana and the quarantana, plus documents belonging to Giuseppe Grossi, son of Tommaso.